The average American woman becomes sexually active at age 17 and wants two children. She will spend approximately 4 years of her sexually active reproductive life either pregnant or trying to get pregnant, and 25+ years trying to avoid pregnancy. Working with a diverse expert panel of family physicians, we have created a Reproductive Health Care Initiative that offers a full range of education and training to support you and your practice teammates in providing essential reproductive health services to your patients. You are encouraged to participate in this online assessment. The knowledge and attitude assessment will give you a sense of practice gaps and assist you in planning educational interventions to close the gaps. Colleagues from every state will be participating, and you’ll be able to see where you fall in the scoring. The assessment also includes the correct answers and all citations and rationales. The LSA is sponsored for .25 AAFP Prescribed or AMA PRA Category 1 credits™ and is free to all health care clinicians. This initiative is anchored by a series of live and enduring activities, including presentations at state AFP chapters. The curriculum was developed by a team of practicing family physicians and is designed to enhance your comfort, confidence and competency in counseling patients on reproductive health life planning. The case-based curriculum is based in One Key Question®; you’ll walk through visits with three patients as you and the women decide together the best path forward for their reproductive health choices. In 2018, this curriculum will be presented at 10 AFP state chapter meetings. Enduring activities will include monographs, videos, tip sheets, articles and potentially an iBook for learners. CAFP, in partnership with Interstate Postgraduate Medical Association, has developed an ABFM Part IV Improving Performance in Practice module. This module is designed to increase the use of One Key Question® for reproductive health planning, enhance physician-patient communication, and improve team approaches to care. The module is approved for ABFM Part IV credit, includes 30 AAFP Prescribed credits upon completion and is based on a team-approach [AMA PRA Category 1™ credit also is available]. The Part IV module is appropriate for any family physician, family medicine resident or other primary care physician plus your teammates. Questions? Contact Shelly Rodrigues at srodrigues@familydocs.org. 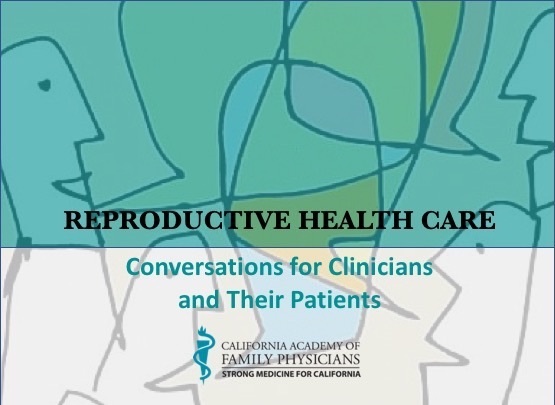 CAFP’s Reproductive Health Initiative has been designed with an expert panel composed of family medicine experts, education and outcomes specialists, and practice team members. The panel’s work includes ongoing review of current literature to enhance understanding of research, guidelines, competencies and public health issues; development of a set of reproductive health competencies; implementation of the live and enduring activities; support for the Learner Self Assessment and MOC modules; and faculty training. Our many thanks to this group of dedicated individuals. A Review of Long-Acting Reversible Contraception Methods and Barriers to Their Use article in Wisconsin Medical Journal (WMJ). WMJ is a peer-reviewed, indexed scientific journal published six times a year by the Wisconsin Medical Society. Health Care Barriers to Provision of Long-Acting Reversible Contraception in Wisconsin article in Wisconsin Medical Journal (WMJ). WMJ is a peer-reviewed, indexed scientific journal published six times a year by the Wisconsin Medical Society. OneKeyQuestion: One Key Question® supports women’s power to decide by helping to transform their health care experience. The notion behind One Key Question® is simple: it asks all health providers and champions who support women to routinely ask, “Would you like to become pregnant in the next year?” From there, the provider or champion takes the conversation in the direction the woman herself indicates is the right one, whether that is family planning, preconception health, prenatal care or other needs. Bedsider Providers: Bedsider doesn't look, sound or act like any medical information you’ve seen before. Bedsider is an online birth control support network for women ages 18-29, operated by Power to Decide, the campaign to prevent unplanned pregnancy, a private non-profit organization. Bedsider is not funded by pharmaceutical companies or governmental agencies. Their goal is to help clinicians and patients find the method of birth control that’s right and learn how to use it consistently and effectively. Reproductive Access: The Reproductive Health Access Project (RHAP) is a national nonprofit organization that works directly with primary care providers, helping them integrate abortion, contraception and miscarriage care into their practices so that everyone can receive this essential health care from their own primary care clinicians. US Medical Eligibility Criteria (MEC) for Contraceptive Use: The Centers for Disease Control and Prevention MEC includes recommendations for using specific contraceptive methods by women and men who have certain characteristics or medical conditions. The recommendations are intended to assist health care providers when they counsel women, men and couples about contraceptive method choice. Notable updates include the addition of recommendations for women with cystic fibrosis, women with multiple sclerosis and women using certain psychotropic drugs or St. John’s wort; revisions to the recommendations for emergency contraception, including the addition of ulipristal acetate; and revisions to the recommendations for postpartum women, women who are breastfeeding and women with known dyslipidemias, migraine headaches, superficial venous disease, gestational trophoblastic disease, sexually transmitted diseases, human immunodeficiency virus or who are using antiretroviral therapy.